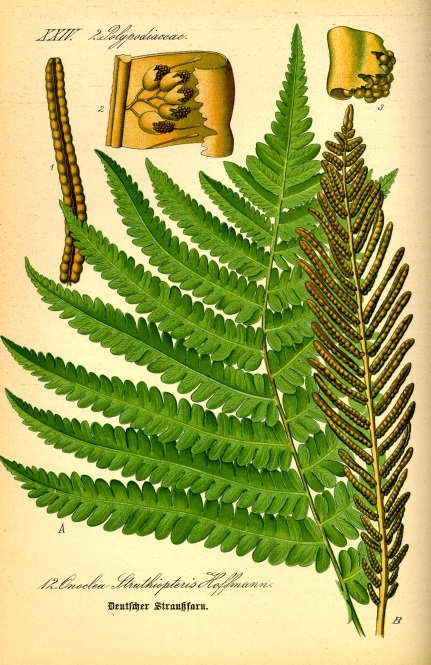 Matteuccia struthiopteris is a fern from deep, branching rhizomes, colonial. Leaves in erect, vase-shaped rosettes from large root-crowns; to 2 m long, sterile leaves with short, green, whitish-hairy stalk, blade narrowly oblong, to 50 cm wide, once pinnate, leaflets pinnately lobed, widest above middle, top more-or-less rounded, base tapered, leaflets numerous, narrowly oblong, tip long-pointed, deeply lobed, lobes oblong, about 20 per side, tips rounded, margins very slightly wavy, leaves early deciduous, sensitive to drought and frost. Spore cases bead-like, replacing leaflet lobes on stiff, club-shaped fertile leaves, persistent, arising mid-summer to autumn, to 70 cm tall, dark green becoming blackish-brown, fertile pinnae to 6 x 0.4 cm, densely crowded. Frequency in NYC: Very infrequent. Possibly not occurring naturally. Origin: Probably only marginally native to NYC. Mostly to the north and west. Habitat: Swamp forests, wet woods in circumneutral soil.